Lovejoy survives perigee - and now plays mini-Ikeya-Seki for Oz et al. 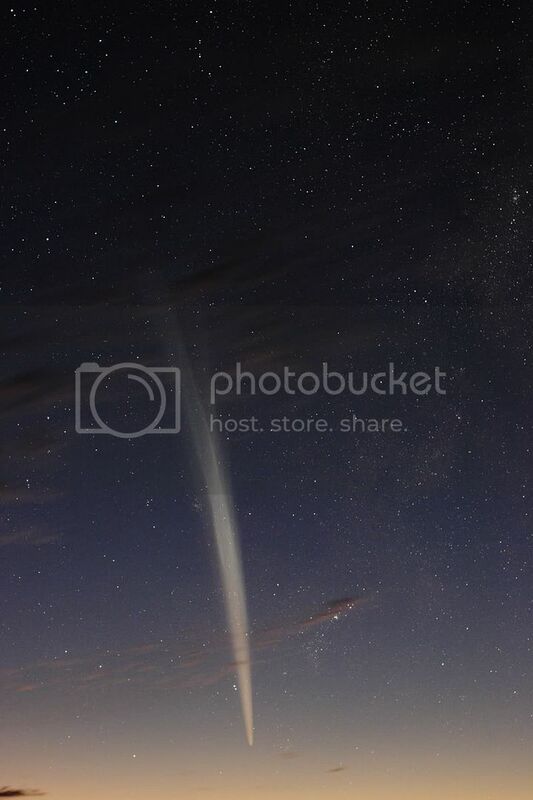 Defying practically all predictions, comet P/2011 W3 (Lovejoy) not only survived perihelion with ease but then formed a long and narrow tail that is well placed for the S. hemisphere now and resembles a small copy of that greatest sungrazer of the 20th century, Ikeya-Seki and giving it a quite good rank among all fine comets. Some picture collections of this amazing comet by V. Tabur, R. McNaught and B. Armstead, protocols of its behavior after and before perihelion, a calculation if its period (roughly 800 years), the lightcurve (that peaked at ~ -4 mag. ), various notes in English, French and German, numerous satellite clips around perihelion (also w/an overly dramatic score and as a ballad ...), the geometries for SOHO and STEREO A (more) and various pictures (earlier). Selected pictures of Dec. 26 local time (dito), Dec. 25 (dito, dito), Dec. 24 (dito, dito, dito, dito, dito, dito, dito, dito, dito, video, another), Dec. 23 (details, more, more, dito, details, more, dito, more, Dec. 22 from the ISS and from the ground (details, more, cloudy, in motion, more), Dec. 21 from the ISS (more & video) and from the ground (dito, dito, dito, dito, dito, details, dito, dito, dito), Dec. 20, Dec. 19 from the ground (earlier) and STEREO A, Dec. 18 from the ground and STEREO A (more), Dec. 17 from the ground (alt., more, explained, dito) and STEREO A (later), Dec. 16/17 LASCO C3 animation, Dec. 14-17 LASCO C3 montage and animation, Dec. 16 LASCO C2 (animation), LASCO C3 and STEREO A, Dec. 15 SDO (alt., alt.) 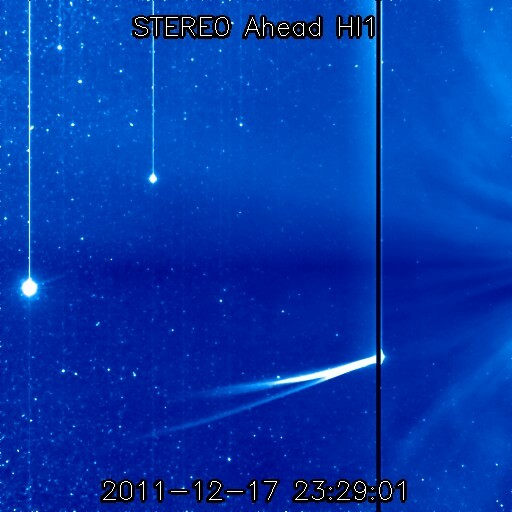 and LASCO C3, Dec. 11 STEREO B and Dec. 4 ground-based. Visual reports of Dec. 25 (a drawing), Dec. 24 (more), Dec. 23, Dec. 20, Dec. 17 and Dec. 16. Press releases and space agency notes of Dec. 24, Dec. 22, Dec. 16 (more and more), Dec. 15, Dec. 14 and various dates. And news, blog and mailing list coverage of Dec. 25, Dec. 24 (dito), Dec. 23 (dito, dito, dito), Dec. 22 (dito, dito, dito, dito, dito, dito, dito), Dec. 19 (dito), Dec. 18 (dito), Dec. 17 (dito, dito, dito, dito, dito), Dec. 16 (dito, dito, dito, dito, dito, dito, dito, dito, dito), Dec. 15 (dito, dito, dito, dito, more), Dec. 13, Dec. 6 and Dec. 5. • In other small bodies news a big paper on active asteroids (more), a bolide over Canada that may have dropped meteorites (more, more, more, more, more and more), a fine Geminids peak mit a peak ZHR of 200 (picture, another, yet another, composite, more, preview, side effect ...), a preview of the 2012 Quadrantids and a paper on the 2011 Draconids, observed from a plane. In other news insights into the chemistry of Pluto, an apparent detection of the rings of Uranus by an amateur (more), recent hi-res Jupiters, all planets in the sky now (here they are), Moon, Venus & Mercury on Nov. 27, space weather visuals, insights, lunar effects and prediction attempts - and a hectic aurora movie. • Insights into the progenitor of SN 2011fe (more, more, more, more, more, more and more press releases and coverage here and hier). • Finally the reentry of a Soyuz upper stage was widely observed in Central Europe yesterday (official word, more and more analysis, further stories here and here and more witness reports) - and an article (p.10-11) on imaging satellites. First ground-based discovery of a Kreutz comet since 1970 - by an Aussie amateur! Many hundreds of sun-grazing comets of the Kreutz family have been found in recent decades by Sun-watching satellites with their coronagraph cameras when they were already very close to the Sun - but with C/2011 W3 (Lovejoy) it was different! For the first time since 1970 this Kreutz comet was discovered weeks before perihelion: by Australian amateur Terry Lovejoy who incidentally also was a pioneer in sungrazer detection in SOHO images. Already before it had a proper number, the object's orbit hinted at a sungrazer, and the 1st 'official' orbit has Lovejoy reach perihelion exactly on Dec. 16 at 0:00 UTC at a solar center distance of 0.00589 AU - that means a mere 140,000 km above the solar photosphere. While ground-discovered Kreutz comets have often become great sky shows, it's doubtful that C/2011 W3 - still very faint: pictures here and here (scroll down) - will survive its brush with the Sun and follow the tradition. 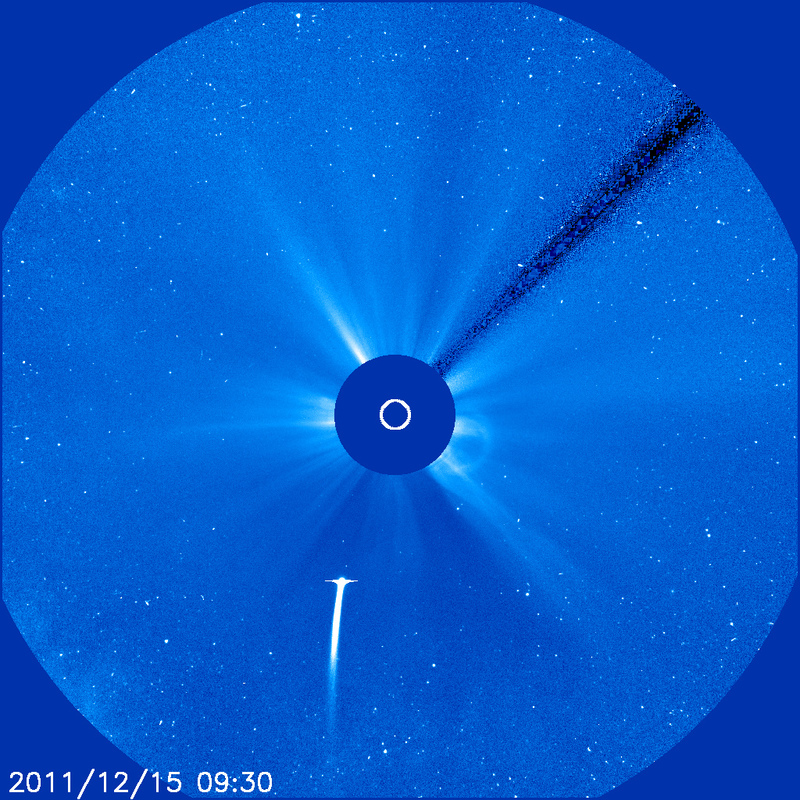 Then again one never knows - and there should at least be a fine performance when Lovejoy enters the FOV of SOHO's coronagraphs on Dec. 12. In other comet news there was yet another amateur discovery - and the first from African soil in some time: comet P/2011 W2 (Rinner), now celebrated in France and elsewhere but always staying faint like now. • Comet Garradd remains a dud for visual observers and a beauty for photographers as pictures from Nov. 28 (more! ), Nov. 27, Nov. 25. (looks like Halley in April 1986, no? ), Nov. 22, Nov. 20, Nov. 19 (more), Nov. 15 and Oct. 28 show; also comets Hill and P/2011 UH55. 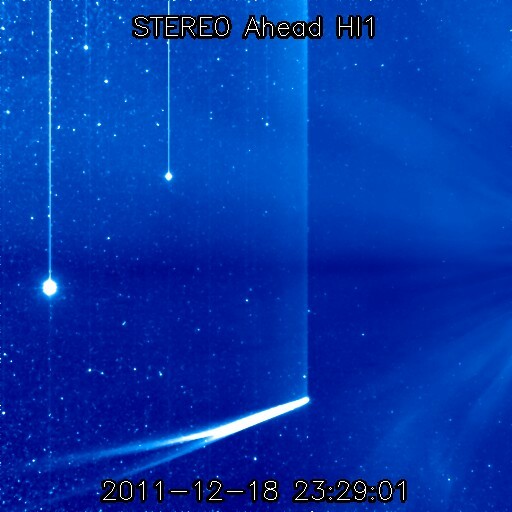 • The Leonids of 2011 reached only a ZHR of 20, as expected, but produced nice fireballs as seen e.g. here, here and here; also a long report about the Draconids 2011 over Egypt. • And talking about things hitting the Earth - or not - news from 65 Myr ago, 200 Myr ago and 252 Myr ago (more and mehr). Yet more results re. NEO 2005 YU55 keep trickling in: joint lightcurves (scroll down), a parallax demonstration, the results from Herschel [Deutsch] (some numbers), the Arecibo radar 'images' and processed - kind of - Goldstone data (plus a summary of earlier stuff). • Also a successful observation of an occultation by Kalliope and all chords, a paper on Themis et al. and a press release on a student NEO discovery. • Some fine Jupiter images of Nov. 25, Nov. 21 (amazing; more), Nov. 16, Nov. 12 and Oct. 21, a weird animation from here. • Plus some constellations: Moon & Venus on Nov. 27 and Nov. 26 (also an attempt from Austria), Moon & Saturn on Nov. 23 and Venus & Mercury on Nov. 13. There was a partial solar eclipse on Nov. 25 which could be observed only in the deepest South: some pictures & stories from South Africa (more) and Antarctica (more), collections here, here, here and here, the funny view from Hinode which saw three eclipses, coverage here, here (more) and here and previews here, here, here and here. • Also a podcast & transcript on upcoming solar eclipse science and stories on the future of the solar cycle, the shape of the solar wind [Deutsch], new Cluster observations (more), solar monitoring by the Proba 2 spacecraft and progress in solar storm forecasting. In other news SN 2011dh in M 51 is still producing science headlines, like on the pre-explosion variability of the progenitor and early radio interferometry observations of the remnant; the latter paper and many more on 2011dh had already been discussed here (and the former one is here). • An amateur apparently captured the dust disk of Beta Pic with just a 10". • A nice 13-min. movie on Namibia's skies, artistic photographs of star trails and experiences on a ship hunting the Aurora off Norway. • The reentry of the latest Soyuz filmed from the ISS (1st minute), Chinese amateurs watching Tiangong, David Levy's logs online, TGFs and the future of UTC after the likely end of the leap second. • Among the sky events in December the lunar eclipse on the 10th dominates: more previews here, here, here, here and here, with a call for observations.